A while back I didn't want to watch the shows Dirty Jobs or Bizzare Foods while we were eating dinner so as not to gross us out,...now I don't even blink at such things. 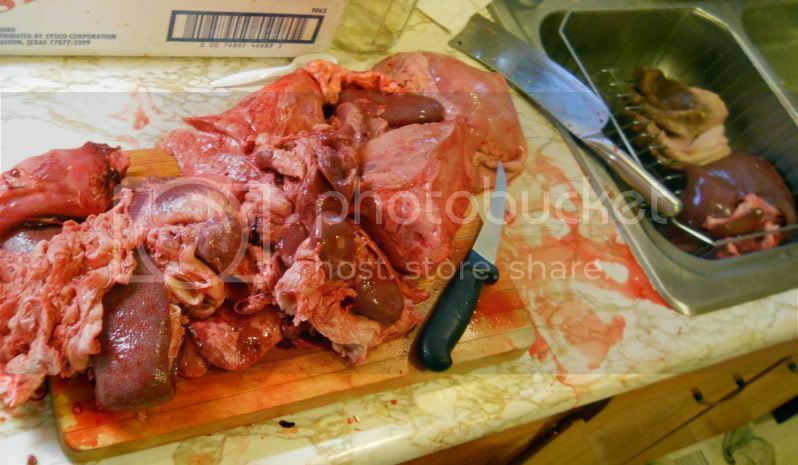 Do you have problems handling offal? I know a lot of people come from vegetarian or vegan lifestyle - that has to be an adjustment. Probably not at all for those who were hunters previously. Are you more straight forward with people and wants now that you are Paleo? pic = insides of one hog - sans intestines which were too stinky to even take out of bag. IMHO, you absolutely SHOULD know the animal you will be eating. i get meat from friends and local farmers. i know its raised super ethically, and slaughtered in a clean and "humane" manner. i dont eat CAFO meat, as a general rule. but those arent the only issues with eating meat. Find Kosher meat if you can. It is certified to be killed in the most humane method possible. Kosher meat has to not suffer as it is killed. I agree - I"m kind of wigged out thinking we'll be visiting a farm and possibly seeing THE COW WE WILL EAT be slaughtered. I'm all for carnivorism, but that's just pushing the limit. I know feathers on is OK,..just some dogs won't want to dig into it and it is messy. The are lots of email groups like on Yahoo that you can join that can give you more ideas for raw feeding - though pretty much anything goes. I have had a lot of luck with people cleaning out freezers or people who dont want meat anymore after a power outage etc. Looking for chicken, turkey, meat processors in your area that sometimes sell boxes of "animal food" - it is like a part time job I find but I could never go back to opening a bag of dog food now that I have seen the light,but it sure would be easier! My knee-jerk response was, naw, I've always had a pretty tough stomach but really, there was no way I'd be peeling chicken feet for my stock, roasting salmon heads (and excitedly I might add), asking to have the liver ground up into the burger/lamb/pork, seek out animal heads, feet, fat, or brainstorm about fermenting animal products (or greenstuf in such a way to mimic what's found in a cow's stomach) 3 years ago. Or even 2 years ago. I'm not 100% paleo or primal but transitioning to a traditional foods diet and being fascinated with other cultures and the way things have been done by indigenous people for centuries has really gotten me into a way of eating and living that I never saw myself in. I'm very thankful for it and life is never boring around here! i really wish i didnt have a problem with that stuff, but i really do. im paleo for health reasons, but i still have a lot of ethical disgust around the idea of eating animal flesh. i still gag when i eat it if i think about what it is- and im just still doing muscle meat, not offal yet. its an adjustment, for sure. i dont think its necessarily an issue of "mental toughness" so much as cognitive dissonance, or desensitization. hoping to get there someday, maybe, because it will make my life a bit easier. I have never had a problem with that kind of stuff. I remember being interested in the hog slaughter on our farm growing up. I have recently switched to the raw feeding of my dog with wonderful results. He was close to being put down due to a "condition" that affected his ability to get up. So, sad, but NOW he is running around like a teenager. He is 10 years old. Even though I scour the web for things I could be feeding him, (allowed), I guess, and I was wondering about chicken with the feather's still on. That would be pretty messy in my yard, but the people who use chicken parts don't show anything about the feathers, just already slaughtered I guess. I mexican grocery used to sell chicken feet, but they are no longer in business. I think I will have to go to the butcher's. I am out of most of my grassfed beef bones and homemade broth. Any suggestions? Sorry, if that is off topic. I could email you.? Yep definitely toughened me up - I was incredibly squeamish at school. Got sent out of science experiments involving dissection and was vegan/veggie in my 20s. Now cutting up livers and hearts for the dogs no problem. One thing I still can't bear to look at - stuffed animals. Took the kids to the Natural History Museum when they little and had to rush past those exhibits - but that's probably because the whole idea of stuffing animals is just too weird and unnecessary - and they have horrid beady glass eyes. Yuk! I've opened up to organ meats, and I watched a cow execution and slaughter online. I wouldn't have a problem seeing one in person. I might still have a problem doing the deed myself though.